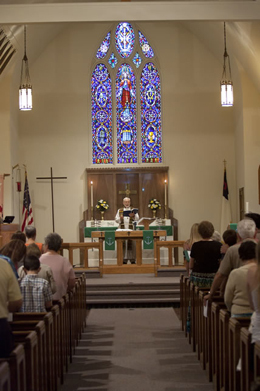 Our congregation worships each week on Saturday evenings at 5:30pm and on Sunday mornings at 9:30am. The congregation staff includes a full-time pastor who resides in our parsonage at 114 N. 8th Street and a part-time office manager/custodian who works 9am to 4pm Tuesday through Thursday which are the church office hours. Our organist is Donna Handeland and our Saturday night lead musician is Alan Morphew.